First, Cut the chicken into several parts. Boiled chicken until slightly soft. Puree onion, garlic, hazelnut, turmeric, salt and sugar. Heat 1 tablespoon oil, add the fine spices, and the last add the chicken. Add the lime leaves and coconut milk. Shrink the fire. Cook until the chicken becomes tender. 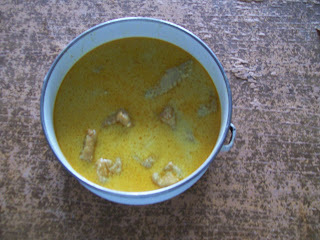 Chicken Curry (Kare Ayam) is ready to serve with warm rice.